Our range of products include weigh in motion system, weigh pads, rail weigh in motion, truck weigh in motion, rapid loadout and truck loadout. Mobile Axle weigh bridges can weigh loads from 1-50 tons per axle. The data management unit has built-in software that records each axle weight separately and indicates the sum total of all the axles to get gross vehicle weight (GVW). 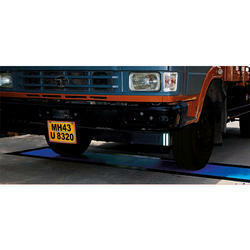 Portable Axle Weigh Bridges are useful for weighing GVW up to maximum 120 tons. Capacity up to 50 tons Axle. Weigh trucks up to 120 tons. Very low cost on Civil work. The weigh pads are very useful for mobile enforcement and for checking the axle weights of the trucks. Rail Weigh-In-Motion is our RDSO approved, tailor-made, train weighing system that is easy to install at low installation cost. Our specialist team develops provides solutions for all rail users, from, raw material procurement to end users. icroprocessor based modular electronics and high quality strain gauges from USA ensure high accuracy even at varying speeds. The system can be designed for static and/or in-motion weighing of wheels, axles and bogies and for full dratt weighing of locomotives and all types ol rolling stock. Rail-Wltvt provides precision data on rack and wagon weights that can be interlaced with client's business systems via PC’s, Ethernet or Internet. By automatically detecting wheel, axle and wagon overloads the system helps to identity imbalanced loads and avoid multiple weighments of the same vehicle ensuring safety and avoiding overloading penalties. Essae provides its proprietary software ’R|Msott’ which helps in getting weigh details in the desired format. It generates, stores and prints reportsof weigh data. These reports can be linked to individual wagons, loads and destinations to help you monitor deliveries to and from customers and suppliers. Maximize Operational Productivity and Cost Savings. Accuracy of ± 1% to ± 2%. Weighing data reports can be interfaced via PCs, Ethernet or Internet. Trucks with axle load higher than legal limits cause a disproportionately higher percentage of damage to the infrastructure and adverse impact on traffic safety. Essae Truck Weigh in motion System (TWIM) is a robust, reliable, maintenance-free weighing mechanism designed for use on highway entries with non-stop heavy traffic. Weighing accuracy and performance are approved for trade use and for law enforcement purposes.When speed is critical and vehicle weighing is an integral part of the operation, Essae TWIM system provides significant cost savings over full-platform and axle scales. The vehicle loads (wheel, axle, GVW, load ratios) are automatically analysed, compared to legal limits and results are displayed on operator’s PC monitor, the driver gets the corresponding printout and the data are also recorded for further reporting or can be sent via LAN or Internet to the server.. This minimizes operator’s mistakes, offers inbuilt data protection and allows vehicle throughput up to 180 vehicles per hour. The vehicle weight, not the number of axles, determines wear and tear of roads. Toll authorities now use weight-based tolling, which relies on weigh in motion technology to determine the proper toll classification while keeping the traffic movin. The Proprietary software ensures fully automatic weighing. Advanced functions like the Vehicle Weighing configuration and classification, law compliance checking, fines computing, or LEF calculations are implemented without any additional costs for the user. Web based architecture with visualization on real time. Communication options – GSM/ GPRS, RS232, TCP/IP Wi fi. Runs on standard web browser. Essae Digitronics is the licensed partner of high-speed rail wagon load-out systems in India using the technical know-how from Kanawha Scales and Systems, USA. Kanawha has designed, built commissioned over 80% of load-out systems worldwide for varied industries such as mining and minerals. Essae has an exclusive expert management team to focus on execution of Rapid loading system projects. Integrated turnkey solutions are provided to individual plants to suit their specific needs. All loaders come with certificate of conformance from National Conformance of Weights and Measures. Our fully automated Rapid load out Systems comply with OIMLR-76 requirements providing accuracy of ±350 kg/wagon and come with sophisticated reporting capabilities that are un-matched in the industry offering a real-time analysis of loading performance. Electronic file and EDI transfer of loadout manifest. KSS’ Automated Truck Loadout Systems will reduce cycle times as well as transaction errors by identifying vehicles via barcode, proximity cards, and/or RFID tags. ReportViewer provides the tools necessary to reduce the vast quantity of transactional data collected, down to only the data that is meaningful to you. With an unlimited number of reports, any report can be customized by changing grouping, sorting, time ranges, etc. Each customized report can then be preconfigured to run on demand or at specific times such as; end of shift, end of day, etc. These reports can be generated in many industry standard formats and can be viewed from or exported to any computer or mobile device. RDT kiosks allow for driver interaction without exiting the vehicle. These NEMA 4 enclosures with integral heater/fan units are mounted at strategic locations throughout your operation. The RDT’s industrial keypad, infrared barcode, or proximity card reader provide the means for the driver to interact with the WeighMaster to enter and verify information. Its vacuum fluorescent display also instructs the driver how to proceed after the transaction has been completed. The polarized filter lens and sunshield provide excellent viewing in high sunlight conditions. RTP kiosks include a high speed, direct thermal ticket printer with cutter bar. After each ticket is printed, the cutter bar cuts the ticket, which then falls into a drop box for easy retrieval by the driver, minimizing paper jams. An integral low paper sensor/indicator is also included to alert of a low paper condition. RFID readers identify trucks by capturing the ID of the tag mounted to the truck and/or trailer. 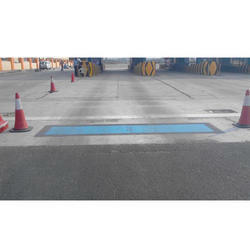 These readers have a range of up to 25’ to provide identification without the need for the truck to stop. Typical applications include scales, entry/exit gates, truck dumps, and loading stations. These rugged, industrial, steel canopies are swivel mounted to protect the kiosks from impacts and environmental damage. Looking for In Motion Weighbridges ?